Back when I went to go see the steam engine, I found some of buildings in the area interesting. After the train left, I took a couple of photos. Since they didn’t fit with the train post, I saved them for a week when I was in the middle of a non-photo project and didn’t get around to shooting anything. Well, that’s been the last three weeks. I really did want to post them though. I love the stained glass awning. Several weeks ago, I went out for my last Fall shoot of the year. There wasn’t much left, but the colors were vibrant. I just barely squished a trip to the fireworks into my 4th of July weekend. Since it was quite possible that my schedule for the next month or more would be tighter than usual, I decided to wait and post them as a regular post rather than a special 4th of July edition that weekend. 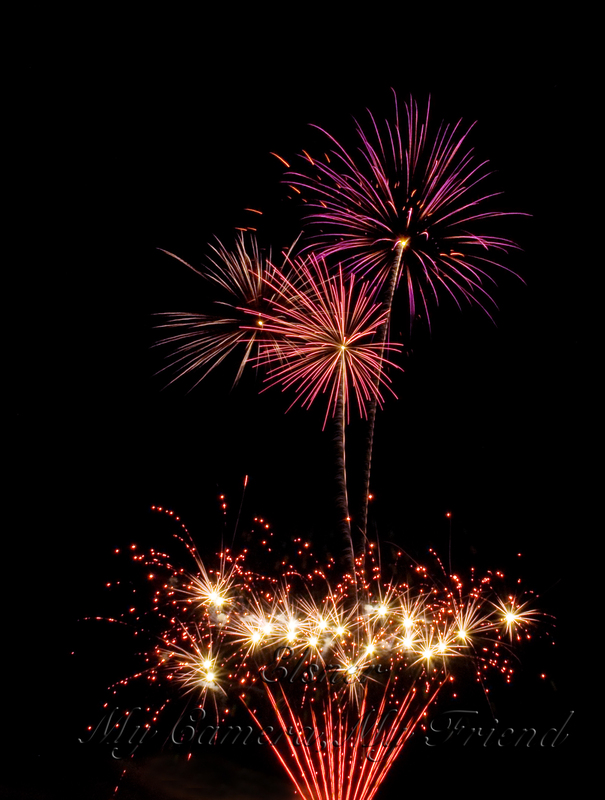 When it comes to photographing fireworks, just like many things in life, there is more than one school of thought. The way I originally learned involves very long shutter speeds where the light is entirely in trails. 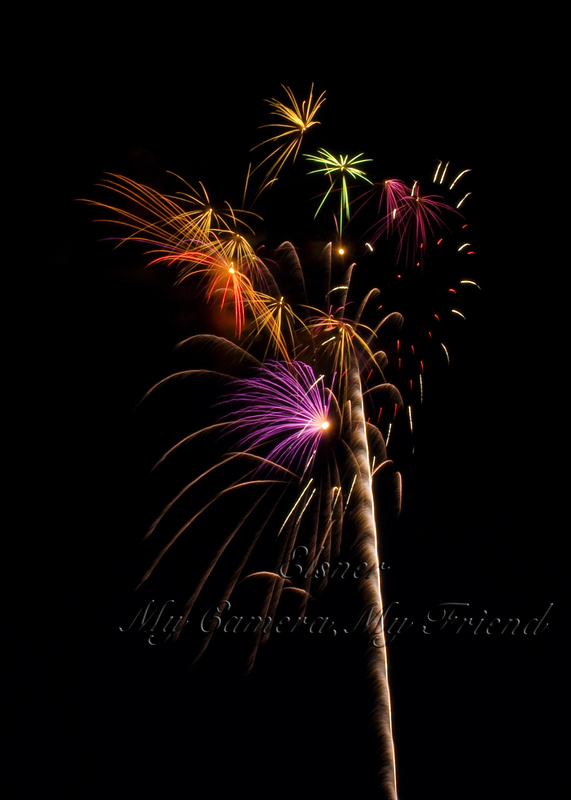 This allows me to have all the colors produced and include several bursts in one shot at the small town show I attend. 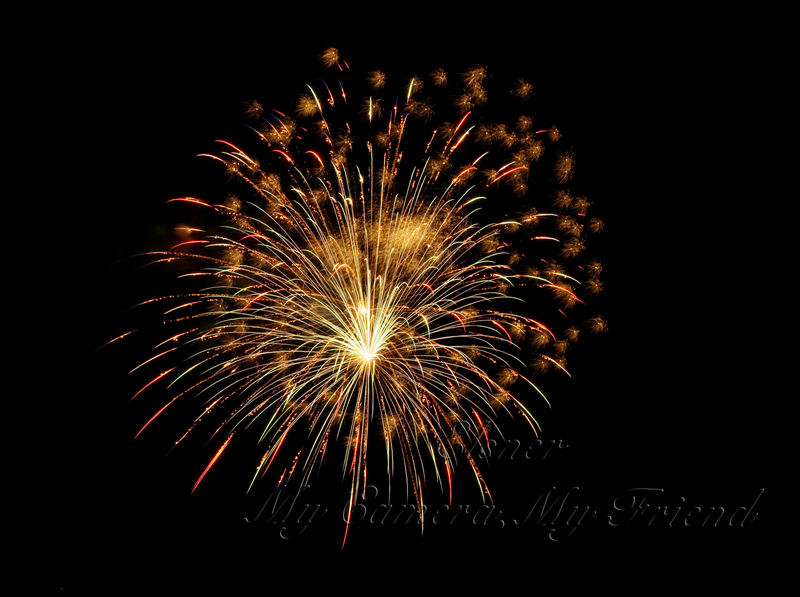 The other method is to use a much shorter shutter speed and capture a lot of the sparkle we know fireworks for. This makes timing trickier. It also makes it more difficult to get multiple blasts in frame at smaller shows that are more likely to send one up at a time. Personally, I also tend to capture more smoke when I have shorter shots with a higher ISO. 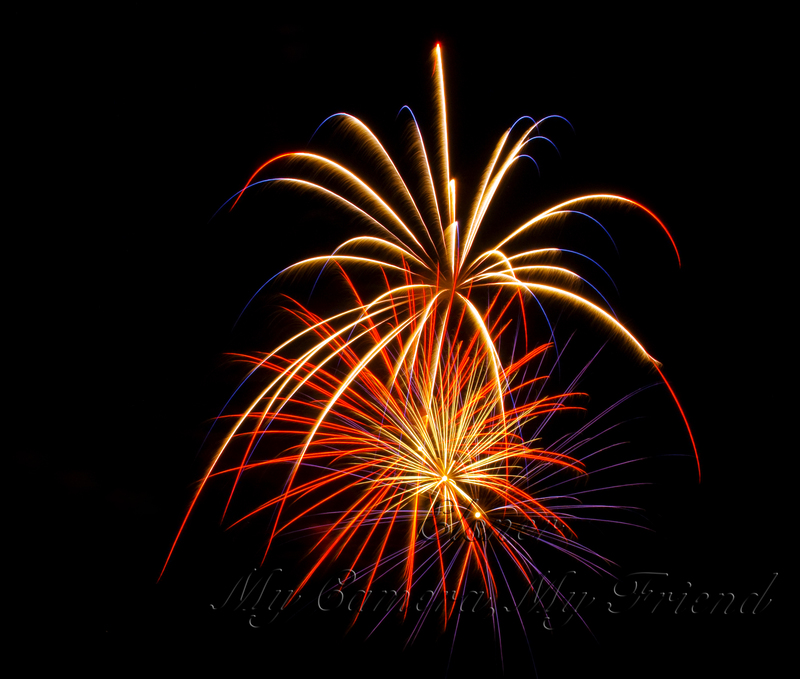 But sparkle is part of the fireworks, so this year, I experimented with getting a few of the blasts cut short a bit so I’d have some more. Well, it’s happening. I’m going to be rather occupied with other matters for the next month. A necessary pain to accomplish a much desired end. I will probably post some archive material that I’ve shot in the past few years and never posted. Who knows, I may even go back to college stuff. Anyway, squirrels will most likely figure in the mix somewhere. Maybe I’ll post my college photo contest finalist shot too. The photo club I belong to had an architectural photography contest about a week ago. Since I don’t photograph much architecture, I grabbed my camera and headed out to find the Buddhist temple everyone was talking about. It wasn’t so easy to find. I kept looping around the section of road I thought it was on. Finally, I stopped and pulled into a side street where two churches and a mosque were located. The lawn of one church was getting mowed, and the mosque was a little busy, so I concentrated on the other church. After a little hunting around, I saw something. It took three exposures and ten curves layers to make it work, but yes, this is what I saw. After that, I decided to give finding the Buddhist temple one more try. This time, I found out that the road it is on goes farther south than I thought it did. It appears to end, but coming at it from a different direction, I saw a sign showing that the road does indeed continue south slightly east of its previous position. Success: a genuine Buddhist temple. What an impressively decorated structure! Ironically, I didn’t end up entering these photos in the club contest. I was sick with stomach flu for three days after taking them. I retouched two and had them printed later in the week only to be reminded that the contest had past. Fortunately, my sense of time has returned, and the club did accomplish some of its purpose in my work: I photographed something I normally wouldn’t have photographed, and I edited my images for competition. Thanks also to my Dad for giving me some black and white editing pointers. I’ve shot some nature, and a plan to shoot more. However, there’s an animal themed Summer reading program at the local library. What do You See in Fireworks? 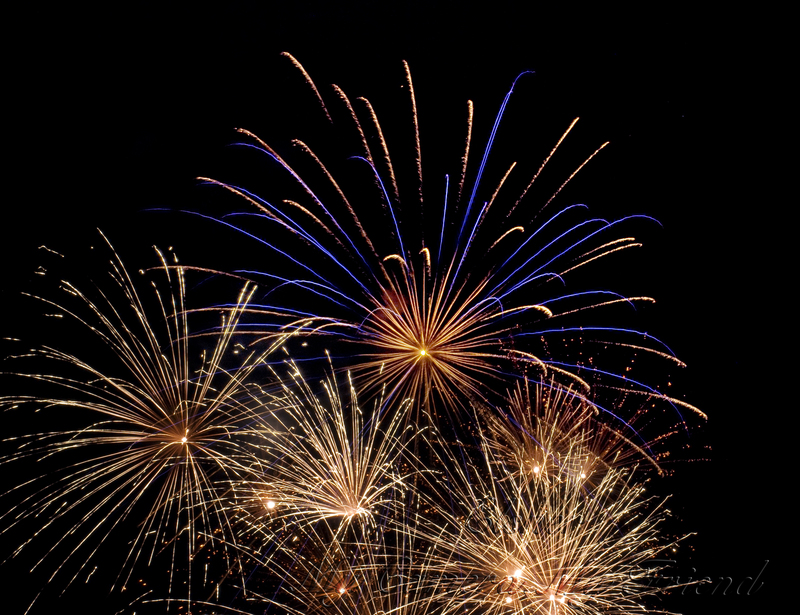 Last week, most Americans spent the evening watching fireworks in one way or another. Most marvel at the colorful bursts that appear and vanish before our eyes. Some of us have a different perspective. Why? 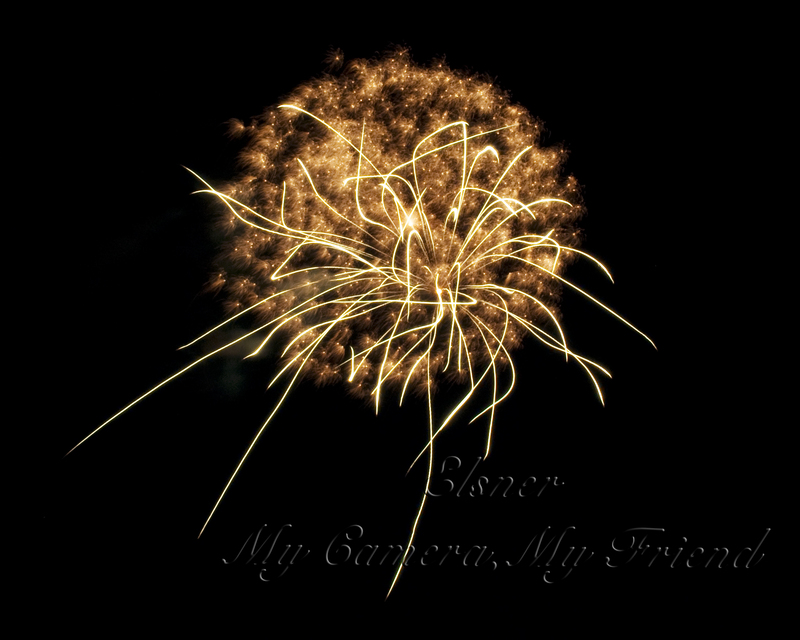 We photograph fireworks and therefore become concerned with how the camera records what is constantly blooming and fading before us. When we press the shutter release, we never quite know what we’re going to get. 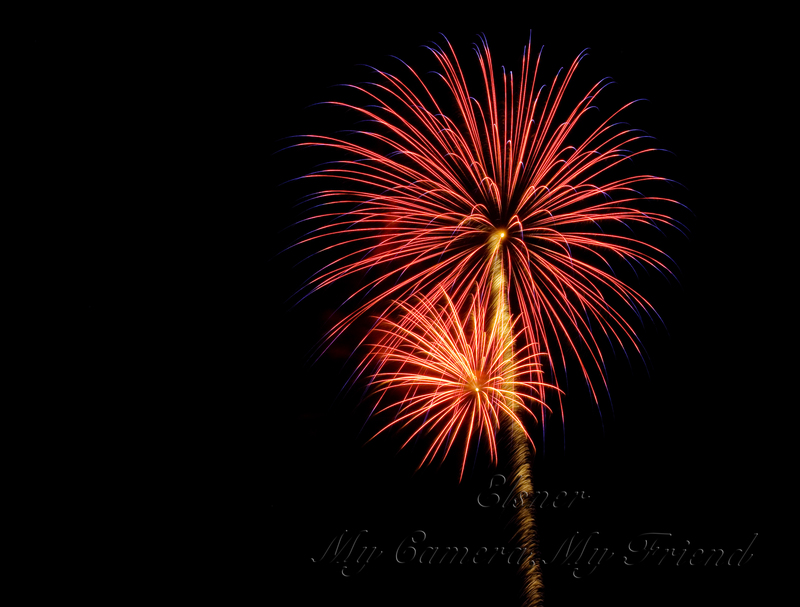 When I go to a fireworks show, set up my camera on a tripod and wait for the first blasts. After that, I typically pick my final location. Sure I guess when I first arrive, but there’s no way to tell for certain where I need to be untill I see some action. After the adjustments I begin to think about what I’m shooting. Do I want the trails from the launch in this? Maybe I should try to press the button a bit later and get less trail? How much should I let the fireworks drift away? Would a sharper approach give more sparkle? How many blast should I hold the button down for? It’s hard to guess what to do. Experience helps, but chance is still a major factor in getting a good shot instead of this tropical paradise of chaos, or something worse. For this one, I’m thinking Mexican fiesta for some odd reason. 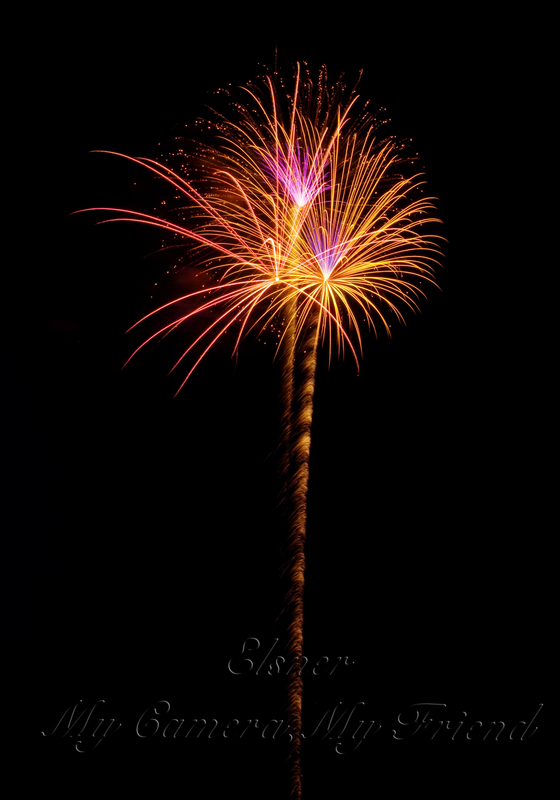 Pressing the shutter release just as the fireworks are launched can record a long trail and may result in a flower-like effect. This combination looks like some weird amoeboid life form or jellyfish. Ones that come up from the ground in continual streams offer some more predictable possibilities. Sometimes, I can get a nice patriotic grouping. Others just come out pretty. 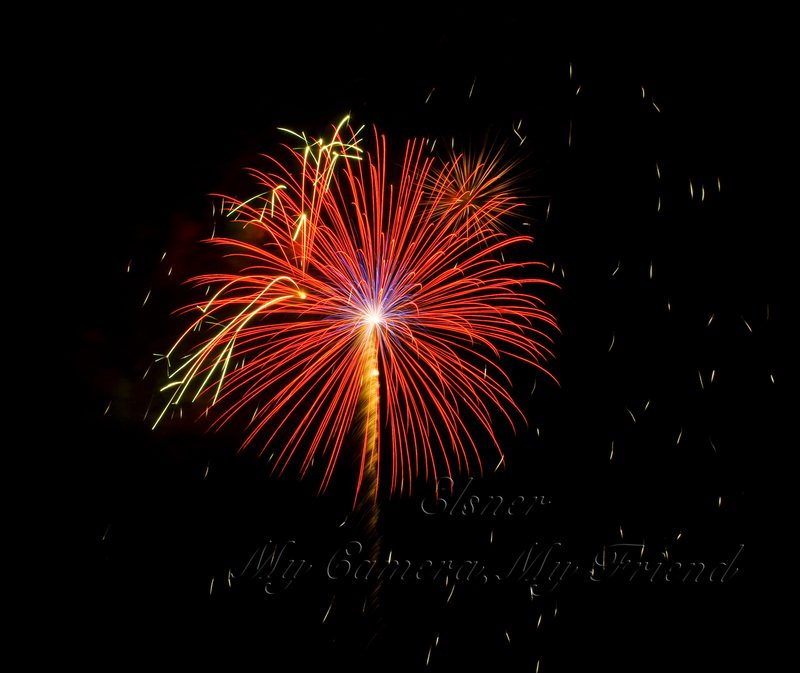 I’m saying goodbye to real fireworks untill next year, but for now I have my unique impressions to enjoy. What do you see when you look at fireworks? I had a brief abstract look at some old playground equipment today, so that might inspire my next post. Otherwise, I may do an informative post on my experience with stock photography so far. I don’t have much information yet, and I’ve not made any money to date, but I can at least share my story and some things I wish I had known from the start (about 3-4 weeks ago? ).